TEI is committed to conservative engineering/design, outstanding performance, a blended balance of aesthetics and function, conscious cost effectiveness and practical engineering. TEI’s design can easily be merged with overall architectural plans, thus combining mechanical and safety requirements with overall project aesthetics. TEI’s innovative design/build capabilities assure each customer a high quality installation with optimum performance capabilities coupled with low maintenance. TEI can also provide initial design and specifications for the internal components. Other services including structural design and complete civil work are also available. No need to shop around! 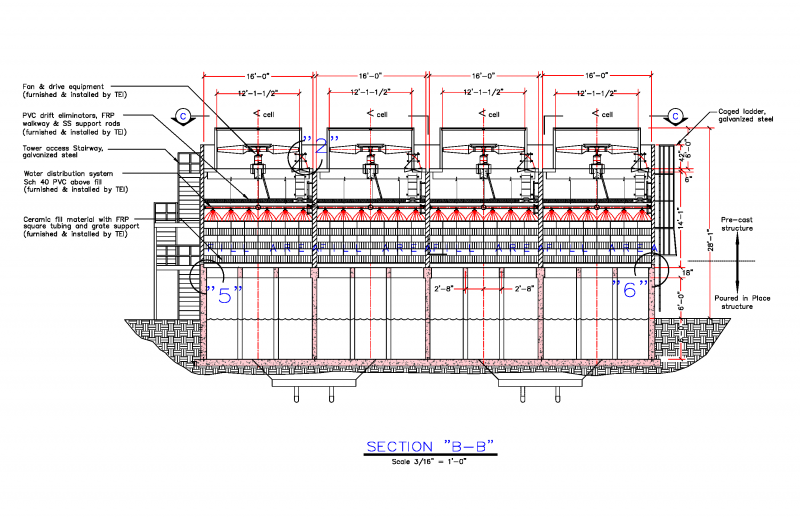 TEI’s broad capabilities offer the owner a competitive cost with a completely integrated cooling tower system. Please contact your TEI’s sales team for design assistance. Below, you will find links to TEI’s standard specifications for both custom and modular structures. As you can see, we have also categorized the specifications based on foreign and domestic applications. Each specification is also customized based on the type of structure and applicable fill media being requested. Please feel free to incorporate any or all of TEI’s specifications for your specific cooling tower needs.